During the first quarter century of its occupation, Israel pursued a policy described by Sara Roy as the, ”de-development of Gaza.” There was no investment in infrastructure, with the local population reduced to a cheap pool of labor working either as day laborers in Israel or as poorly paid sub-contractors working for Israeli exporters. The poverty of the place was palpable, as was the congestion. Gaza is among the most densely populated places on earth. Because 70% of Gazans are refugees living in camps, they received education, some medical and social services thanks the UNRWA – the United Nations agency created to provide for Palestinian refugees. But not much more. A visit to the border revealed the hardships faced by the tens of thousands of Gazans who relied on day labor employment in Israel. Because, by Israeli law they could not overnight in Israel and they were forced to leave their homes before dawn to get to the border before 6 am in hopes of being selected for a day’s work in construction, agriculture, or janitorial services. The lucky ones were loaded on trucks taken to their jobs and, at the end of the day, they were driven back to the border. Exhausted, they got home late at night to sleep and then to repeat the process the next day. As desperate and deplorable as conditions were in Gaza back then, in many ways, those were the “good years”. Likud hardline policies, violence, and provocation, coupled with Hamas’ instigated acts of terrorism served to make a bad situation worse. Ariel Sharon’s decision to unilaterally withdraw from Gaza and his refusal (despite US Secretary of State Condoleza Rice’s entreaties) to allow for an orderly hand-off of the administration of the Strip to the Palestinian Authority, paved the way for an eventual Hamas take-over. The blockade was especially cruel with the Israelis allowing in only enough food to provide for the minimum caloric intake to sustain life and no support to infrastructure repair. Ninety-five percent of Gaza’s water is contaminated and undrinkable and most residents receive only between two to four hours of electricity daily. Poverty levels have reached extreme levels as has unemployment. For the last three decades, youth unemployment has hovered between 70% to 80% – meaning that most young Palestinians in Gaza have never had a job and have no prospect of a job. 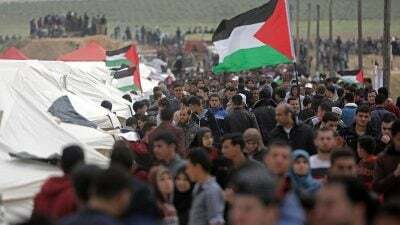 It breaks my heart when I read of the despair of a young protester in Gaza who was recently quoted saying “No peace, no jobs, no unity, and no future, so what difference would death make? If we are going to die, then let it not be in vain”. The entire affair has been more like a “turkey shoot” then a military confrontation, with innocent protesters who are captives in the world’s largest open air prison being randomly picked off by sniper fire. Even more sickening was the recently released video of a sniper shooting and hitting a Palestinian while his fellow snipers cheered his success. The Israeli response to this video has been to call for punishing the maker of the video and not the sniper who killed the unarmed protester. In the weeks ahead, I hope to see Palestinians in the West Bank and Jerusalem, and Palestinians in Lebanon and Jordan join this “Great March”. Attention must be paid to this long-suffering people, whether they be the desperate in Gaza, or their compatriots who also long for and deserve that the world acknowledge their right to be recognized as equal human beings.